I used Amour Rain Glitter polish as a base (it's a dupe for OPI Mad as a Hatter but MUCH cheaper), topped with two coats of Deborah Lippmann Happy Birthday over it. For Tinkerbell on the ring finger, I used American Apparel Summer Peach for her skin, American Apparel Manila for her hair, which I also mixed with A Beautiful Life Poison to shade her hair. For her lips, I used A Beautiful Life Poison, for her eyes, I used Sally Hansen Professional Lavender Cloud, then Orly Cosmic FX Lunar Eclipse for the iris, with American Apparel Hassid for the eyelashes and brow. For the green of her dress, I used CND Green Scene , and for her wings, I used OPI What's With the Cattitude?. For the shading on her face, ears, etc, I used a mixture of American Apparel Summer Peach and American Apparel Rose Bowl. For the thumb version of Tink, I used American Apparel Summer Peach for the skin, American Apparel Manila for the hair, OPI What's With the Cattitude? for the wings, and a combination of Sally Hansen InstaDry Spring Green and CND Green Scene for the dress and shoes. Topped everything off with 2 coats of Seche Vite top coat. The best part of going to Disney is when they fly Tinkerbell out of the Castle and on the line thingy right before the fireworks each night. PS. You did a fabulous job on the nails. The nails are soo perfect!!!!! 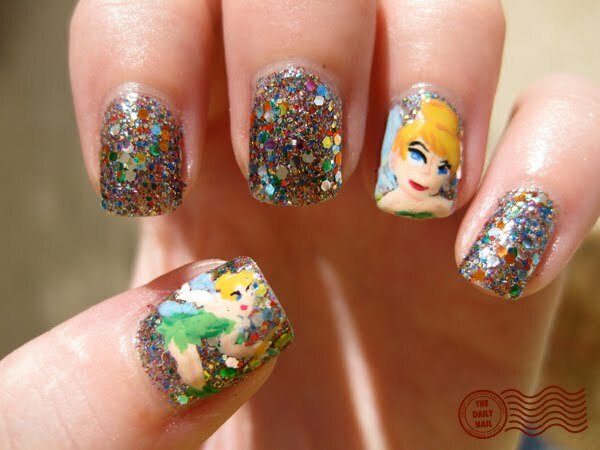 I love your Tinkerbell mani! 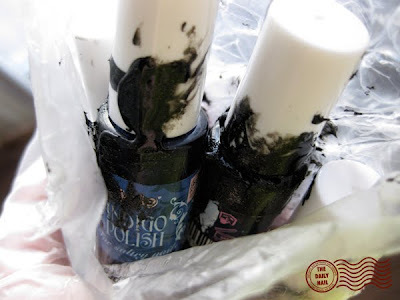 And I'm glad your Eyeko polish was only leaking, not broken. Ohhh, the glitter nails are SO fun!! I have such a love for glitter and sparkly. And when you add in Tink... seriously, how can it get better? But I'm totally jealous of your art skills. I couldn't draw tinkerbell on paper, let alone on my nail! WOW!!!! This is AMAZING! Sooooo glittery. And tinkerbell looks wonderful. I can't believe you managed to paint her on such a small surface and so perfectly. I just died and went to heaven! I am OBSESSED with Tinkerbell. Like more obsessed than a normal 21 year old should be! wow! Amazing glitter nails! Tinkerbell is so detailed and beautiful! the same thing happened to me when i ordered from eyeko but it had broken and was unusable, i was quite disappointed. Your nailbeds are second to none! I've seen a billion pictures of Happy Birthday, but this is the one that pushed me from "eh it's cool but..." into "Want!" territory. I'm not typically the talkative type, so I don't comment often on many blogs, but while I'm here I also wanted to say that I love all your nail art and it's a pleasure to check out your blog every day! the tinkerbell is unbelievable!! well done! oh i LOVE LOVE LOVE this!!! So sparkly and adorable! :) Wish I was creative as you when it comes to nail paintings! I hate disney characters but i love your nails so much! seriously!